My, this is a sprightly one. There’s a definite liveliness to the key action on the Roccat Horde Aimo. In comparison with other mid-price keyboards it’s like having a trampoline for your fingers. This is all deliberate, of course. Roccat have never been shy about trying new ideas, and with the Horde they’ve explored the concept of ‘membranical’ technology. It’s a halfway house between more traditional keyboard designs, which are usually built around (cheap, quiet and spongy) rubber domes, or (expensive, noisy but precise) mechanical keys. The Horde is Roccat’s attempt to get the best of both. Although there’s still a rubber membrane sitting beneath the keys, they’ve tuned the action to mimic the response times of a much costlier mechanical device. The keys trigger at the halfway point of travel and they spring back in a manner that can only be described as perky. Couple this with near-silent operation and a mid-level of resistance from each key, and you’ve got a keyboard that really does hit the midpoint between both types of technology. It’s unlikely to convert mechanical-keyboard purists, but it’s a very pleasing compromise for the rest of us. Unusually, the Horde features laptop-style island keys, with a fair amount of space between each key. It’s a design which protects against the accidental ingress of rogue pizza toppings, but it also makes typing feel a little more deliberate than it might be. Luckily, the keys are substantially higher than on a standard laptop keyboard, so there’s still a satisfying feel to be had if you’re bashing out an angry email or clacking away on your latest novella. It also has five additional low-profile macro keys that activate faster to help you out in games. Physically, the Horde is a fairly nondescript slab of plastic, but it’s worth pointing out the strange bulge at the top. This is a dock for a phone holder, which you can 3D-print at home for use with Roccat’s Power Grid smartphone app. The blueprints don’t currently seem to be available on Roccat’s website, so check the latest situation if this is a feature that appeals to you. Still, it’s a nice touch. More promising is the rack of function keys that Roccat have included at the top of the unit. We’re totally used to seeing media player controls on gaming keyboards by now, but these go a step further with extra keys to vary the keyboard illumination, brightness and special effects. By far the best innovation is a dedicated tuning wheel at the top right, which makes it a breeze to perform adjustments to volume and lighting settings. It’s a great addition and so handy that I’d wager it’ll come as standard in all higher-end keyboards in the very near future. The Horde Aimo’s other big feature comes in the form of customisable lighting. 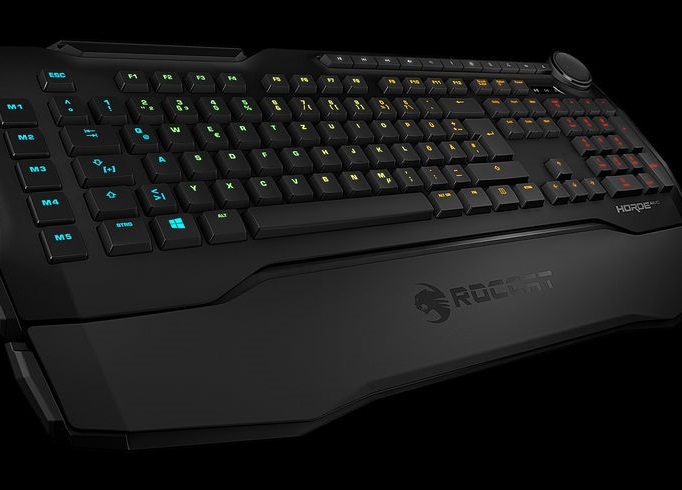 The keyboard is split into six zones which are all individually controllable, and the built-in illumination options vary from simple one-colour schemes to Roccat’s own software, which dynamically changes the lighting according to the actions being performed on screen. It’s also possible to pair the keyboard with any other product in the Aimo range to get effects which co-ordinate across the various peripherals. While the Aimo effects are undeniably impressive, there are a couple of missteps here which deserve a mention. Firstly, even at maximum settings, the lighting is hardly eye-searingly bright. RGB lighting is there to look pretty, right? Well, it would look even prettier if it was possible to turn it up a bit. It’s also a puzzle as to why Roccat don’t allow you to pick out those all-important WASD keys and give them their own separate colours. Lastly, some of the keys are much better lit than others, so there’s a slight unevenness to the illumination across the keyboard. None of these drawbacks are particularly severe, but a few a few improvements in this area would have really made a difference. Finally, no review of any Roccat product would be complete without mentioning the software. As with all their other kit, the Horde Aimo is immensely customisable, and it’s possible to map primary and secondary functions to many of the keys using Roccat’s ‘easy shift’ technology. I confess that I’d have liked a dedicated button to activate this, rather than having it share space it with the Caps Lock key, and I also found the drag-and-drop programming interface a tad frustrating at times. 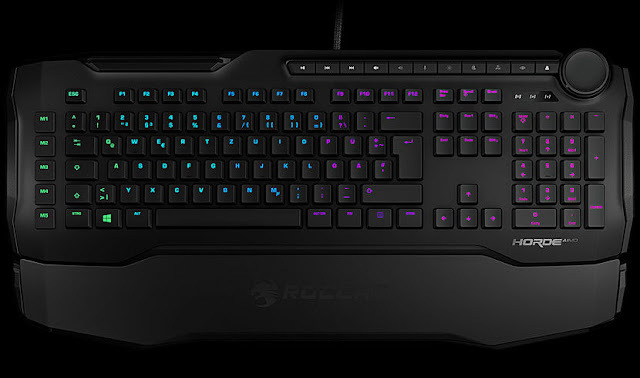 Overall though, if you want to program your keyboard to do strange and wonderful things, Roccat have got you covered. Time to wrap this one up. In the end, the Horde Aimo impresses with the sheer amount of ideas that Roccat have managed to pack into its design. Responsive membrane keys? Check. Funky lighting? Gotcha. Pizza resistance? Yep. It’s a shame that it has a few quirks which stop it achieving the stellar heights of their Kone Aimo mouse, but it’s still a good choice for anyone looking for a reasonably-priced gaming keyboard with a ton of features.